Yu-Gi-Oh! 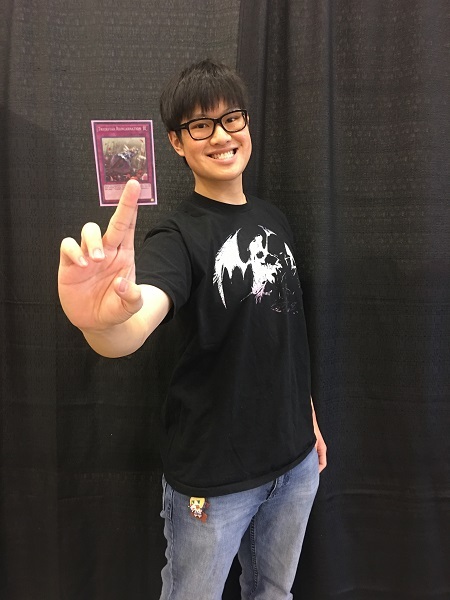 TCG Event Coverage » YCS Niagara Falls First-Timers! Home > 2018/10 - Niagara, ON, Yu-Gi-Oh! Championship Series	> YCS Niagara Falls First-Timers! There’s a Yu-Gi-Oh! Championship Series event here in Niagara Falls, Canada for the first time ever, giving local Duelists a convenient opportunity to compete at one of the highest levels of competition! Check out which Duelists competing this weekend are playing in their first YCS event! 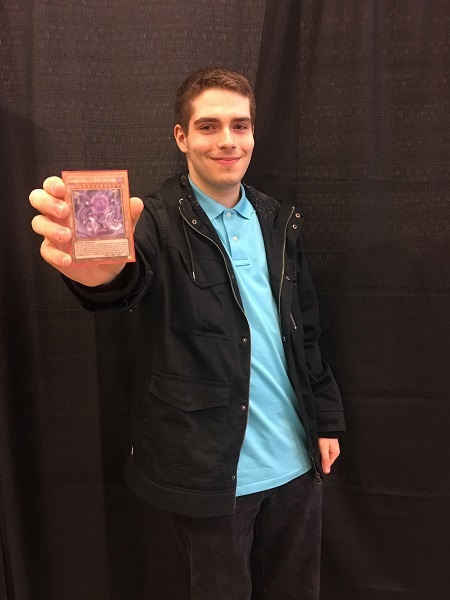 19-year-old Kenneth Stewart from Stouffville, Ontario took a 2-hour drive to compete in his first-ever YCS event! He came here with 2 friends that he has known since elementary school: Nathaniel Wong and Brenton Jackson. Both of them are also YCS first-timers! Stewart has never played in any events other than a few local tournaments, but regularly Duels against his friends. He’s using a Gouki Deck this weekend. He had only been using it for the past 2 weeks, but practiced a lot against his friends. Will his recent practice translate into success in this weekend’s event? 19-year-old Nathaniel Wong from Stouffville, Ontario has never entered any type of Yu-Gi-Oh! tournament before, and is creating his first tournament experience right here in Niagara Falls, Canada! He casually Duels against his friends often, and is hoping that his experience doing so has prepared him for this tournament. Wong is using a Trickstar Deck this weekend, and is well-practiced against Kenneth Stewart’s Gouki Deck and Brenton Jackson’s Cubic Deck. 19-year-old Brenton Jackson from Stouffville, Ontario has never competed in a Yu-Gi-Oh! TRADING CARD GAME tournament before! Now he’s here with his friends using a Cubic Deck! He’s using Cubics because he likes the style of the theme and the cool effects of the Cubic monsters. He has been using his Cubic Deck for as long as he has been playing Yu-Gi-Oh! – at least 2 years – and says he constantly improved the Deck over time. That’s why he’s trusting his Cubic Deck in this weekend’s tournament. Jackson’s favorite Cubic monster is Crimson Nova the Dark Cubic Lord. 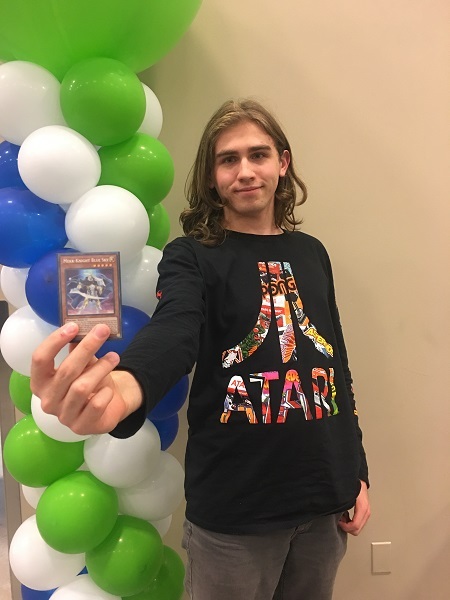 19-year-old Jay Paulsen from Williamsville, New York drove to YCS Niagara Falls with his friends to Duel in his first YCS event! He has competed in many local tournaments and a handful of Regional events, but never competed in a YCS event. He’s using an Invoked Mekk-Knight Deck this weekend, featuring his favorite card in his Main Deck, Mekk-Knight Blue Sky. The tournament hasn’t started yet, but he’s already having fun just hanging out with his friends and looking at the stuff the vendors here are selling. 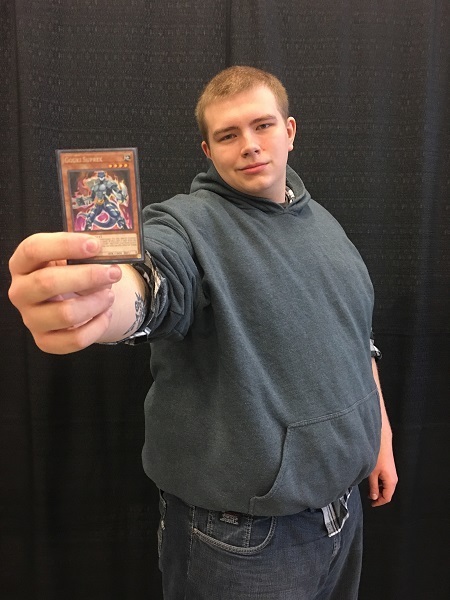 18-year-old Dalton Leone from Williamsville, New York traveled to YCS Niagara Falls with Jay Paulsen and is brand new to the YCS scene. He has competed in 1 Regional event and a bunch of local tournaments, but never in a tournament of this magnitude! He’s using a HERO Deck this weekend. 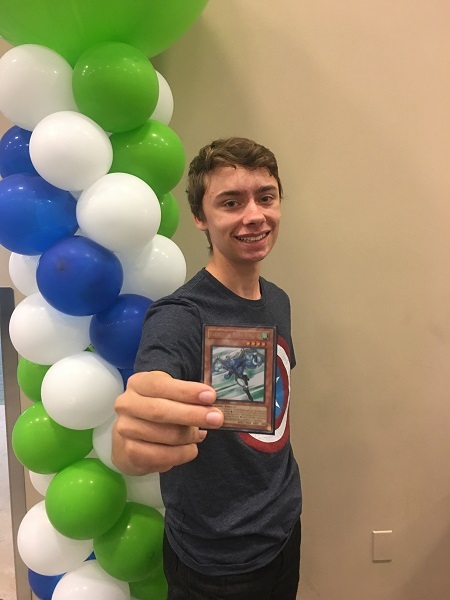 He said HERO has always been his favorite Deck, so he wanted to bring it to his first YCS. Here’s Leone holding up his favorite HERO monster – the newly Limited Elemental HERO Stratos! Will one of our YCS first-timers win the tournament, or will a seasoned Dueling veteran claim victory this weekend? It’s almost time to Duel! Round 1 Feature Match: Jesse Kotton versus Dakota Tomines Welcome to YCS Niagara, Ontario!